Stay on top of your order thanks to notification emails and tracking systems for the chosen courier as soon as your garments leave our warehouses. Deliveries are made during weekdays from 9:00 to 19:00, but flexibility & Saturday delivery can be possible depending on order details. What are the delivery days & hours? Dispatches are made from Monday to Friday between 9:00 and 19:00. But if you’re in need of delivery outside of this schedule, we also offer special out-of-hours services. Please, contact us to find out more. It is hard to give you an exact price as this entirely depends on how heavy the package is. The more garments you order, the more the price varies. Materials also affect the end result as these have different weights; it will always cost more to transport a hoodie than a vest, for example. But just to give you an idea, a next day delivery of 20 tees will be around £7.99. Yes. 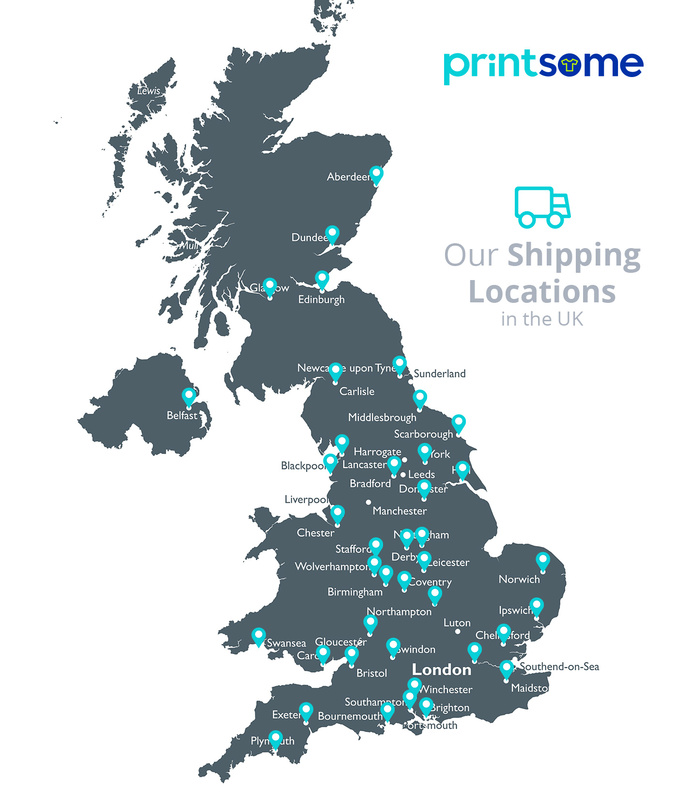 Garments can be dispatched internationally to a certain number of territories. Keep in mind that pricing for this type of orders are on a case by case basis and import taxes (plus any other cost related to offshore deliveries) are the customer’s responsibility. Yes. In order for garments to arrive safely, all packages are sent via tracked courier services which require someone’s signature upon delivery. My package came in damaged. What do I do? As soon as possible, take some pictures of the damage and submit a claim using the Returns & Exchanges form. Keep in mind that our customers’ orders travel in quite resilient double-walled boxes. This means that even if they get bumped during transit, it will probably be just cosmetic and won’t affect the contents. Is the delivery 100% guaranteed to arrive on time? Trust us when we say that we do everything in our power to make sure all packages arrive on time. Unfortunately, there are still rare cases where unexpected issues with courier services may cause delays.